The Text of the Gospels: Mark 6:22 - Whose Daughter Danced? Whose daughter danced for Herod? Was it his own daughter, or the daughter of Herodias? The first-century historian Josephus reports (in Antiquities of the Jews, Book 18)) that Herodias’ daughter was named Salome and that she was Herod’s grand-niece, not his daughter. Matthew 14:6 affirms that she was Herodias’ daughter. Not only was the dancer not Herod’s physical daughter; she was not Herod’s daughter under Mosaic Law, either: her mother Herodias, after marrying Herod II (the son of Herod the Great and Mariamne II), had divorced him, and – against Jewish Law – married his brother, Herod Antipas. As Josephus stated: “Herodias took it upon herself to confound the laws of our country, and divorced herself from her husband while he was alive, and was married to Herod Antipas.” It was because of this violation of Jewish law that John the Baptist, according to Matthew 14:3-4 and Mark 6:17-18, had spoken out against the unlawful marriage – with the result that Herod Antipas had John the Baptist imprisoned. With that background in mind, we come to the textual problem. As the superscripted numbers and letters in the NET, NRSV, NIV, and CSB suggest, the difference in these translations’ rendering of Mark 6:22 is due to a difference in manuscripts. The footnotes in the NRSV, the NIV, and CSB are (as usual) too vague to do much more than confuse their readers. Quite a bit more data is found in the NET’s textual note, in which the annotator explains that the NET’s editors chose to have their translation say that the dancer was Herod’s daughter despite the “historical difficulties” that it involves. Or to put it another way: even though Matthew says that Herodias was the dancer’s mother, the NET’s editors chose to adopt the reading in which Mark says otherwise, because it is the most difficult reading – difficult, because it is erroneous – and thus the reading which copyists were most likely to alter. ● τῆς θυγατρὸς αὐτου Ἡρῳδιάδος – “his daughter Herodias” – is supported by À B D L Δ 238 and 565. ● τῆς θυγατρὸς τῆς Ἡρῳδιάδος – “the daughter of Herodias” – is supported by family 1, 15 minuscules, and by four Old Latin manuscripts (aur, b, c, and f – that is, VL 15 (Codex Aureus Holmiensis, copied c. 775), VL 4 (Codex Veronensis, copied at the end of the 400s), VL 6 (Codex Colbertinus, copied in the 1100s), and VL 10 (Codex Brixianus, copied in the 500s)). Allied with them, according to the textual apparatus in the fourth edition of the UBS Greek New Testament, are the Sinaitic Syriac manuscript, the Peshitta, the Palestinian Aramaic version, the Sahidic version, the Bohairic version, the Gothic version, the Armenian version, the Old Georgian version, and the Ethiopic version. ● τῆς θυγατρὸς αὐτῆς τῆς Ἡρῳδιάδος – “the daughter of Herodias herself” or “the daughter of this same Herodias” – is supported by about 99% of the Greek manuscripts of Mark, including Codices A C K M N U Γ Θ Π fam-13, 33, 157, 579, 700, 892, 1010, 1195, 1241, 1424, and 2474. Allied with this mainly (but by no means exclusively) Byzantine army of witnesses are the Harklean Syriac (produced in 616), the Vulgate (produced in 383), and Old Latin manuscripts a, d, ff2, i, l, q, and r1 – that is, VL 3 (Codex Vercellensis, copied in the late 300s), VL 5 (the Latin section of Codex Bezae, copied in the 400s or 500s), VL 8 (Codex Corbeiensis Secundus, copied in the 400s), VL 17 (Codex Vindobonensis, copied in the late 400s), VL 11 (Codex Rehdigeranus, copied in the early 700s), Codex Monacensis, copied in the 500s or 600s), and VL 14 (Codex Usserianus Primus, copied c. 600). ● τῆς θυγατρὸς αὐτῆς Ἡρῳδιάδος – “her daughter Herodias” – is supported by Codex W and a smattering of minuscules. 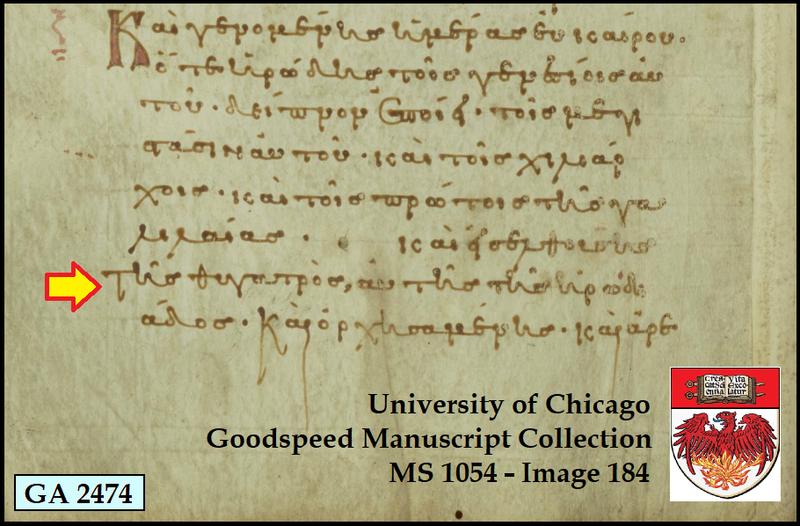 array of evidence, including hundreds of Greek MSS. It should be noted that the second reading (“the daughter of Herodias”) and the third reading (“the daughter of Herodias herself”) mean basically the same thing. Both refer to the dancer as the daughter of Herodias. Only the first reading says that the dancer was the daughter of Herod – a claim that appears to contradict both Matthew 14:6 and Josephus’ statements. In other words, by adopting this reading, the Nestle-Aland/UBS editors appear to have placed an erroneous statement into the text. The "his daughter" variant in Codex 037. Neverthless, Metzger, instead of promoting the reading with αὐτου on internal grounds, stated that the UBS Committee narrowly decided in its favor due to the external evidence, stating in his Textual Commentary, “A majority of the Committee decided, somewhat reluctantly, that the reading with αὐτου [i.e., the first reading], despite the historical and contextual difficulties, must be adopted on the strength of its external attestation.” This illustrates that “reasoned eclectic” approach of the UBS editors is, to a very large extent, eclectic in name only, favoring the joint testimony of a very small team of manuscripts over virtually everything else. The Tyndale House edition of the Greek New Testament, however, reads τῆς θυγατρὸς αὐτῆς τῆς Ἡρῳδιάδος (“the daughter of Herodias herself”), and its apparatus does not even include an entry to alert readers of the existence that a textual contest exists at this point. Many other compilations of the Greek New Testament agree with the reading in the Tyndale House edition at this point, including not only the Robinson-Pierpont Byzantine Textform, but also the Greek New Testament compilations prepared by J. M. A. Scholz (1829), by Karl Lachmann (1831), by J. M. S. Baljon (1898), by Eberhard Nestle (1904), by Alexander Souter (1910), and the 1969 edition of the Nestle-Aland compilation. – it becomes clear that the second and fourth readings can be explained as the effects of momentary carelessness on the part of copyists whose exemplars contained the third reading: the second reading was produced by a copyist who accidentally omitted αὐτῆς when his line of sight drifted from the ς at the end of θυγατρὸς, and the fourth reading was produced by a copyist who accidentally omitted τῆς when his line of sight drifted from the ς at the end of αὐτῆς to the ς at the end of τῆς. Thus all of the witnesses for the second, third, and fourth reading may be considered allies which favor τῆς θυγατρὸς αὐτῆς τῆς Ἡρῳδιάδος, directly or indirectly. Yet the NET’s annotator claims that this is not adequate external support. Whatever approach is reflected by such claims, it is not really eclecticism. Some clarity about the reliability of the main witnesses for the reading with αὐτου (“his”) in 6:22 may be gained by considering some of their readings in nearby passages. ■ In 6:17, the copyist of Codex Vaticanus did not include the words τὴν γυναῖκα (the words are added in the margin by a corrector). ■ In 6:22b, À B C* L Δ and 33 and a smattering of minuscules read ἤρεσεν instead of καὶ ἀρεσάσης which is supported by all other Greek manuscripts. 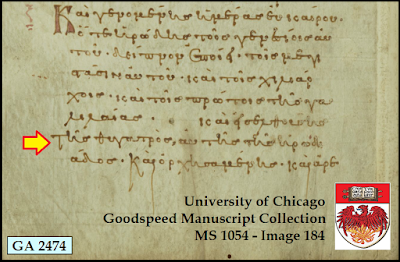 The editors of the Nestle-Aland/UBS compilation preferred the Alexandrian reading here – and in doing so, they rejected the testimony of Papyrus 45, the earliest manuscript of this part of the Gospel of Mark. Although P45 is extensively damaged in chapter 6, this reading is preserved. This constitutes an agreement between the Byzantine Text and the earliest manuscript of this part of Mark. ■ In 6:22c, the words in the opening phrase are transposed and slightly different in Sinaiticus, Vaticanus, C* L and Δ – ὁ δὲ βασιλεὺς εἶπεν – instead of the usual εἶπεν ὁ βασιλεὺς. These manuscripts disagree with the word-order in the earliest manuscript, Papyrus 45, in which ν [the final surviving letter of εἶπεν] ὁ Ἡρώδης was written before Ἡρώδης was corrected (above the line) to βασιλεὺς. In all three of these variant-units, the SBL-GNT, compiled by Michael Holmes, supports the Byzantine reading. So does the Tyndale House GNT. The SBLGNT also reads τῆς θυγατρὸς αὐτῆς τῆς Ἡρῳδιάδος (the daughter of Herodias herself). Clearly not everyone is convinced that the Alexandrian witnesses are especially reliable in this particular passage. Having established that the support for τῆς θυγατρὸς αὐτου Ἡρῳδιάδος is extremely limited, and that the supportive manuscripts seem to be less reliable than usual elsewhere in the verse, let’s turn to a couple of issues concerning the internal evidence. First, how would copyists start with τῆς θυγατρὸς αὐτῆς τῆς Ἡρῳδιάδος and end up with τῆς θυγατρὸς αὐτου Ἡρῳδιάδος? Such a transition is not difficult if an early copyist had an exemplar with the reading found in Codex W (τῆς θυγατρὸς αὐτῆς Ἡρῳδιάδος), and, with Herod prominent in his mind as the focus of the previous verse, inattentively wrote αὐτου instead of αὐτῆς. The few subsequent copyists who preserved the resultant reading τῆς θυγατρὸς αὐτου Ἡρῳδιάδος rationalized that Mark must have used the term “daughter” to refer to a step-daughter, and that the dancer, like several members of Herod’s extended family, shared a name with another family-member. Second, is it plausible that Mark wrote τῆς θυγατρὸς αὐτου Ἡρῳδιάδος? The answer is firmly no. Introducing the dancer as Herod’s daughter, fully aware that she was Herodias’ daughter (as Mark affirms in 6:24), immediately after explaining that Herod’s marriage to Herodias was not valid, would be like saying that a man and a woman were committing adultery, and then saying that the woman’s daughter was nevertheless the daughter of the adulterer – and that she happened to have the same name as the adulteress. It is extremely unlikely that Mark would ever drop such a statement upon his readers without explanation; it is much more likely that an early copyist made a simple mistake, which a small number of disciplined copyists perpetuated. Third, how would copyists be likely to adjust the text if they found τῆς θυγατρὸς αὐτου Ἡρῳδιάδος in their exemplars and considered such a statement (that the dancer was Herod’s daughter, and that she was named Herodias) historically erroneous? Their first resort would be to conform the Markan text to the parallel-passage in Matthew 14:6 – but such a conformation to ἡ θυγάτηρ τῆς Ἡρῳδιάδος does not seem to have been attempted by any copyists. The only obvious scribal recklessness in Matthew 14:6 is displayed in Codex Bezae, where the text reads αὐτου (“his”) instead of τῆς, and Ἡρῳδιὰς instead of Ἡρῳδιάδος. Presently, readers of the CSB and NIV only encounter the English echo of a scribal mistake in Mark 6:22 in their Bible’s footnotes, and ESV-readers do not encounter it at all. But as long as these three versions are subject to constant revision, there is a very real possibility that in a future edition of the ESV or CSB or NIV, the English text of Mark 6:22 may be changed to resemble the errant text found in the NET and NRSV, corresponding to the errant text in the Nestle-Aland compilation. Quotations designated NET are from the NET Bible® copyright ©1996-2016 by Biblical Studies Press, L.L.C. http://netbible.com All rights reserved. Quotations designated NIV are from the NIV New International Version (NIV) Holy Bible, New International Version®, NIV® Copyright ©1973, 1978, 1984, 2011 by Biblica, Inc.® Used by permission of Zondervan. All rights reserved worldwide. Quotations designated NRSV are from the Revised Standard Version of the Bible, copyright © 1946, 1952, and 1971 National Council of the Churches of Christ in the United States of America. Used by permission. All rights reserved. Quotations designated CSB® are taken from the Christian Standard Bible®, Copyright © 2017 by Holman Bible Publishers. Used by permission. Christian Standard Bible®, and CSB® are federally registered trademarks of Holman Bible Publishers.